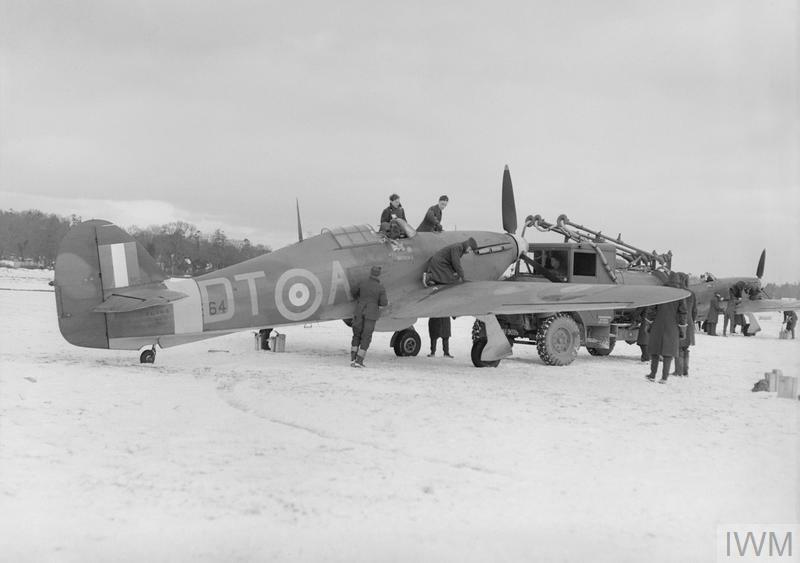 "Hurricane Mk I of Squadron Leader Robert Stanford Tuck, commanding No 257 Squadron, refuelling at Coltishall, early January 1941." © IWM (CH 1931). Italian/Greek Campaign: The Italians on 3 January 1941 commit two fresh divisions in the area of the Klisura Pass, which is on the road to the key port of Valona. They also begin a small counteroffensive north and west of Korcë. Neither offensive accomplishes much, but casualties mount on both sides. The counterattacks are pretty much over by the end of the day. European Air Operations: The Luftwaffe switches back to one of its favorite targets tonight. It sends 178 bombers that hit the Bristol port area hard. The granary warehouse on Princes Wharf is obliterated, taking with it 8000 tons of grain. The raid lasts for 12 hours and is considered the the longest sustained attack on Bristol. There are 149 deaths and 351 other casualties. A 4000 lb aerial mine comes to rest without exploding - the citizens quickly nickname it "Satan" and, after it is disarmed, it becomes an emblem of the hardships the city has faced. 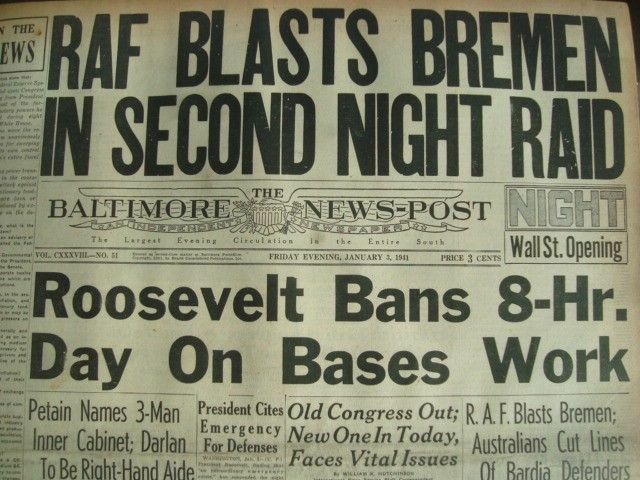 RAF Bomber Command raids Bremen for the second night in a row, this time with 71 aircraft. The Italian Corpo Aereo Italiano (CAI) withdraws from the Channel coast after having accomplished virtually nothing there except incur heavy losses. The Luftwaffe night fighting force continues to gain experience, with Lt. Gerhard Böhme of 3./NJG 2 downing a Whitley bomber southeast of Flamborough Head. Baltimore News-Post, 3 January 1941: The RAF raid on Bremen is big news, the brewing Australian victory at Bardia gets barely a mention. Battle of the Atlantic: The RAF bombs a bridge in the Kiel Canal, and it falls on 2803 ton Finnish freighter Yrsa, sinking it and blocking the canal. However, the canal is shallow, and in any event the ship must be removed so that it does not prove to be a hazard to navigation. So, the ship is raised and returned to service, with the canal being reopened.. The RAF attack on Bremen over the night claims 1460 ton Finnish freighter Liisa. However, it sinks in shallow water near the docks and can be salvaged. British 2466 ton freighter Pinewood hits a mine and sinks south of Southend. There are six deaths, 18 survivors. Royal Navy 70 ton drifter New Spray founders in a storm off Sheerness in the Thames Estuary. Convoy OB 269 departs from Liverpool, Convoy FN 374 departs from Southend, Convoy FS 378 departs from Methil, Convoy BS 12 departs from Suez. Royal Navy corvette HMS Hydrangea (K 39, Lt. Joseph E. Woolfenden.) is commissioned. Battle of the Mediterranean: Operation Compass resumes. At 06:00, Australian Major General Iven Mackay sends his 6th Australian Division against the Italian defenses at Bardia. The Australians attack from the west, and they are assisted by Royal Navy barrages (led by battleships HMS Warspite, Barham and Valiant) between 08:10 and 08:55, and RAF bombing. Monitor HMS Terror, gunboats HMS Ladybird and Aphis, and destroyers HMS Dainty and HMAS Voyager assist in the bombardment. The Italian air force attacks the ships offshore and score a near miss on gunboat Aphis that causes some damage, kills two and wounds three others. In the initial stage, sappers blow holes in the barbed wire using Bangalore torpedoes, then engineers rush in and fill the tank ditches using picks and shovels. Once that is done, 23 Matilda II tanks rush through the opening and quickly reach the second main defense line (the "Switch Line"). 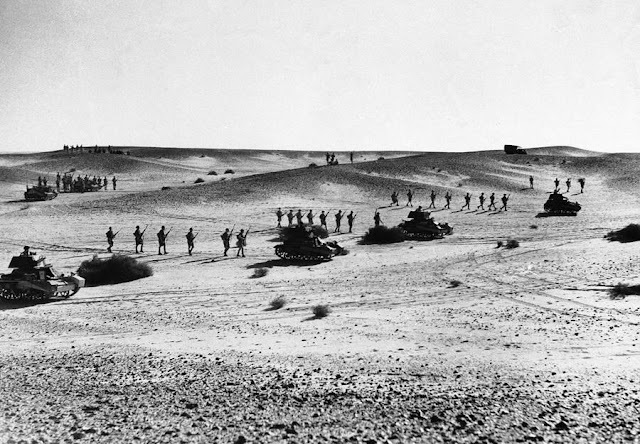 The Australians advance two miles and capture 8000 prisoners by 08:30. While the attack is a huge success and the Italian position hopeless, the Italians hold out through the night in Bardia itself. The weather throughout the Mediterranean is characterized by strong force 8 gales and heavy seas. At Malta, four Sunderland flying boats are damaged in waves up to 15 feet. Luftwaffe units continue transferring to Italy. Australian troops on exercise in the desert near Bardia, 3 January 1941 (AP Photo). [W]e would like it stated that the relief goods are available only by the good will of His Majesty's Government. There is an argument made by some that Churchill is reluctant to admit anything through the blockade because his goal is to "starve Europe" as a means of hurting the Nazi war effort. However, this particular aid specifically is aimed at unoccupied sections of Europe, so there is little reason for Churchill to block it even were that argument true. Roosevelt somewhat obliquely hints that providing aid may instead cause disaffection from the Nazis in Europe and thus help the Allied war effort. Both men's positions are unprovable and may stem from deeper motivations than just the effect on military operations. The issue of humanitarian aid to Europe is very complex, with many nuances, and remains a contentious issue between Great Britain and the United States until 1945. Drawing it perhaps over-simplistically, the available evidence does show that Roosevelt attempts to expand the amount of aid to the peoples of Europe throughout the war, while Church is prone to limiting it. Irish/German Relations: The Luftwaffe hits Dublin again, injuring 20 people at Donore Terrace near South Circle Road. Following several nights of Luftwaffe bombing, Éamon de Valera protests officially to the German government. Swedish/German Relations: Sweden completes its deliveries of Junkers Ju 86K bombers (built by Saab under license) to the Luftwaffe. While overall an outdated design, the K variant with 905 hp Bristol Mercury XIX radial engines proves quite handy. The Ju 86 was used throughout the first few years of the war by both sides, particularly by South Africa's SAAF. Some of the Luftwaffe Ju 86K's will be converted to Ju 86P high-altitude bombers and photo reconnaissance versions that can approach altitudes of 50,000 feet, making them for a long time invulnerable to interception. US Military: The issue of hemispheric defense is at the top of the War Department's agenda. Discussions with Brazilian representatives have been gradually building a case for defending the bulge of Brazil from aggressors. Rainbow 4, the US defense plan in the case of aggression from both east and west, envisions movement of a reinforced triangular division to Brazil. Today, Chief of Staff General George C. Marshal holds meetings with and gains the approval of Admiral Stark and Undersecretary of State Sumner Welles for the movement of five companies of American soldiers to different Brazilian airfields upon the outbreak of hostilities. This must meet with Brazilian approval, which has not yet been sought. The issue of the defense of Brazil continues to simmer throughout 1941. Soviet Military: The first series of war games continues. Georgy Zhukov commands the invading forces, while General DG Pavlov commands the defending forces. These games, which began on 2 January, will continue through 6 January. 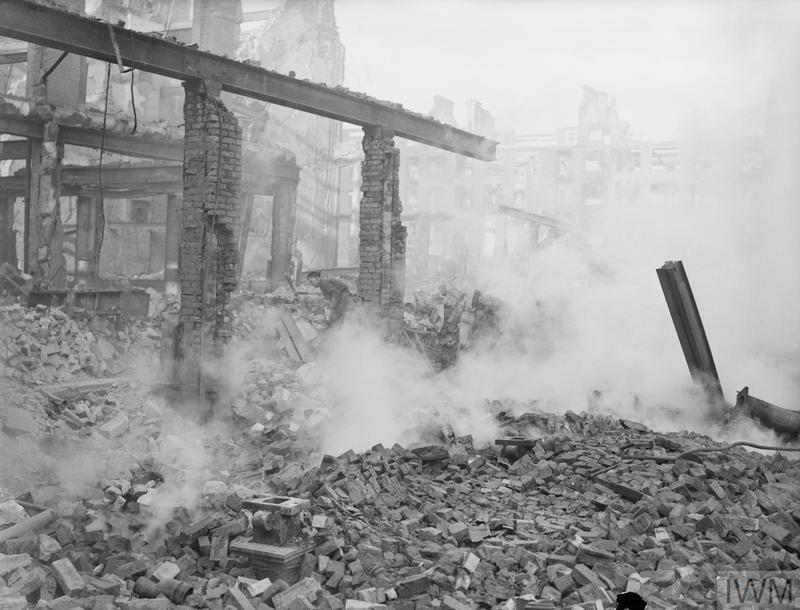 "Men of the Auxiliary Military Pioneer Corps (AMPC) search buildings demolished by bombing in Fore Street in the City of London, 3 January 1941." © IWM (H 6379). [B]ecause it is perfectly obvious that so much tonnage in the way of ships has been going to the bottom for a year and a half, probably at the end of the war, sooner or later, there will be a shortage—a world shortage—of tonnage. Therefore, we have begun taking the first steps toward a program of building about 200 merchant ships—a program which will cost somewhere around $300 million, between $300 million and $350 million, in a number of new plants. Roosevelt is somewhat dismissive about the quality of the ships he is planning to build. "Nobody that loves ships can be very proud of them," he says, but "by building this dreadful looking object you save six or eight months" from building "a ship that is really a ship." He adds that the ships will be "roughly, about 7500 tons each." Obviously, the details - including where the ships will be built, and who will build them - remain to be worked out. Roosevelt says that he has $36 million available to build the shipyards from "the President's Special Contract Authorization Fund." The questions at the news conference somewhat predictably focus on where all this money is going to be spent. These ships at this point have no name, though they will quickly acquire various belittling appellations ("dreadful looking objects" is one such term, another is dreamt up by Time Magazine: "ugly ducklings"). However, we know these ships by another name coined later in 1941 that has stuck: Liberty Ships. At his press conference, President Roosevelt also announces that he is sending crony Harry Hopkins to London as his "personal representative" until an ambassador is appointed. Joseph Kennedy withdrew from the slot in November as a result of British anger at some of his controversial statements and attitudes. However, Kennedy's resignation still has not taken effect, so technically the position is not open yet. Separately, USS Tuscaloosa departs from Lisbon for Norfolk, Virginia, having delivered new Ambassador to France Admiral William D. Leahy to Europe. USS Gar (SS 206) on 3 January 1941. Visible on the right is USS Mackerel (SS 204) (US Navy Submarine Force Museum). Vichy French Government: Marshal Petain reorganizes his cabinet. Among other changes, he appoints Admiral Darlan to head the ministries of Justice and the Interior, Pierre Etienne Flandin in charge of economic affairs, and General Huntziger becomes defense minister. This is a period of great turmoil and change in the Vichy government, with people changing jobs routinely. Flandin, incidentally, will later reveal that, at this time, he is noticing episodes of memory loss by Petain. The old marshal, for instance, always seems to adopt the position of the last person who had talked to him - because he could not remember earlier arguments. Finnish Government: The new Prime Minister of Finland, Johan Rangell, takes office and appoints his cabinet. German Homefront: Martin Bormann issues a decree (Normalschrifterlass) banning gothic typefaces and instituting roman/Antiqua type as the new standard. Gothic typeface is very difficult to read, particularly by those in occupied Europe who are not used to it. Gothic typeface can still be seen in various out-of-the-way places in Germany, and the Berlin subways retained it long after the war (and yes, it is very difficult to read even in giant-sized letters). Making the typeface more readable apparently is Adolf Hitler's idea. This reflects an ongoing shift in opinion within the United States in favor of supporting Great Britain and opposing Germany. Earlier in the war, opinion surveys reflected a much more ambivalent attitude by the public at large, with about half the country opposed to any intervention in Europe. 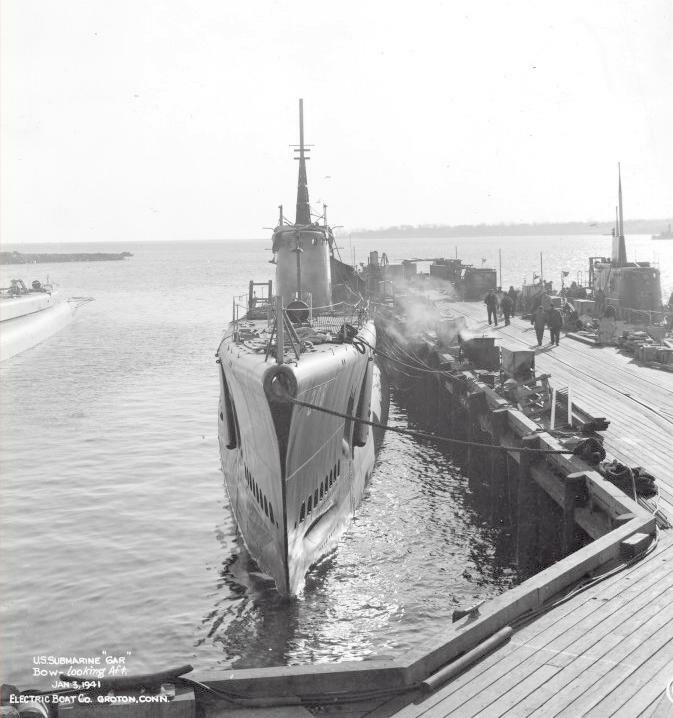 USS Gar (SS 206), 3 January 1941. 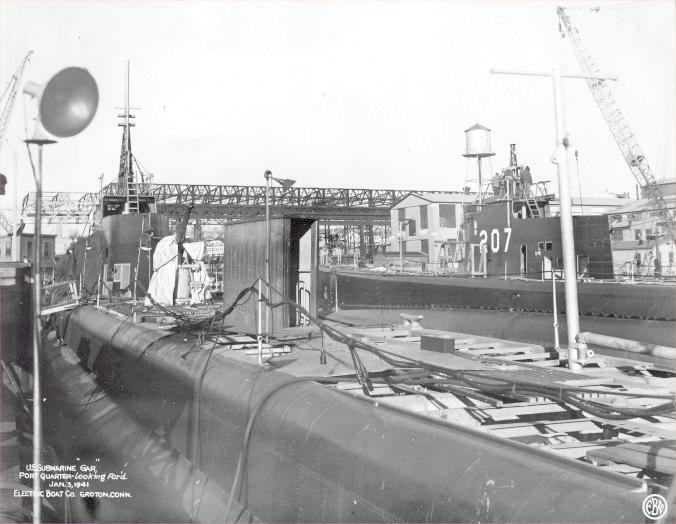 Visible on the right is USS Grampus (SS 207) (US Navy Submarine Force Museum). July 26, 1940: Capture The Duke?